I know that you are thinking, what a strange topic to be talking about on an online business blog. However I have my reasons as you will soon see. 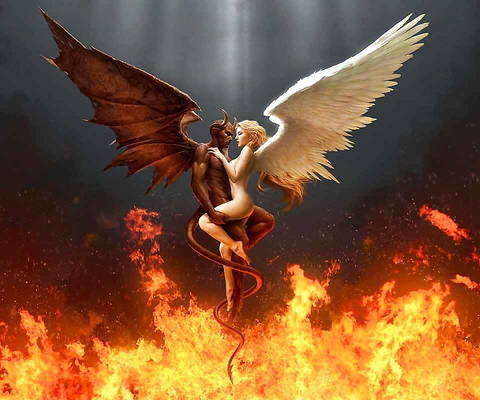 For those who believe that good always triumphs over evil often fall hard when they experience just the opposite. In fact not only has good lost to evil, evil has established a strong foothold and continues to gain ground. And when it comes to the Internet, it is still the wild, wild west! With that said, even though good doesn’t always win over evil; doing good always triumphs over doing evil. And this concept is especially important to realize over the long run both in business and in life. The same can be said about truth over deception. Even though there are those who make a good living from deception, most of the time it’s usually just short-term. And like good, truth doesn’t always win out! But being truthful helps to build character, and establishes who you are to others which is important, especially when you are serious about doing business online. However, even those who practice honesty find at times that they have pushed truth to the edge in exchange for success. And that is where the fly is in the ointment so to speak. Just don’t let it happen to you! Everyone carries biases, it is in our human nature. And within those biases comes our sense of direction, ethics and modes of operation as it were. So when we speak the truth or do good, it comes from our biased sense of what we see as good or as truthful. Most everyone can tell an outright lie and agree it is just that. But not everyone can see a deception especially when it is presented on the edge of truth (that is, contains a truth within it) which we even see in main stream media. Regardless, it is still a lie. And often with deception comes justification. It has become a very powerful tool for those who practice it. That is why it prospers, why it is easier to believe. And once it is believed, it grows, especially with those who seek shallow virtues and are driven by fortune or fame. It produces gullibility within these individuals which in turn makes the workings of deception even more effective. The old saying, “You can only fool some of the people, some of the time (but you can’t fool mom)” has changed to, “You can fool some of the people, most of the time (even mom), and it is usually enough to show a profit!” But it can only last so long. The more deception that is done, the more skeptical people who have been burnt by it become, and eventually stop buying from anyone, even when it comes to the legitimate. Eventually, no one will make anything because of it. Which leads to my last point, trust. Trust can be granted by others outright but is often earned over time. Once you have proven that you can be trusted, you normally have won a customer, or friend, for life. But if you are not trustworthy and burn someone just once, not only have you lost a customer for life, but even lose those who they know. It is always easier to acquire a bad reputation from others than it is to gain a good one. And even when you have a good reputation, it can change in an instant if you don’t stay the course. Unfortunately, overcoming a bad reputation is much, much harder to do than keeping a good one. So why not do it right at the start. So if you want to build a meaningful, lasting business, then it is important for you to always remain above board, being truthful and doing right by others whenever possible that builds trust, and more importantly lasting relationships. Tagged business ethics, character, deception, good and evil, reputation, trustworthy, truth, truthful, virtues. You’ve made some excellent points Michel. I think that many well meaning people push the envelope just because they see other succeed. They don’t realize that they’re stepping over the line. But the more people like you stand up and remind us that there is right and wrong,the more people will be able to see where the line is. Many will still choose to step over it though. Thank you, Bill, for your thoughtful comment. Too many good people just look at the short-term gain and miss the bigger picture; building a lasting business that starts with integrity.